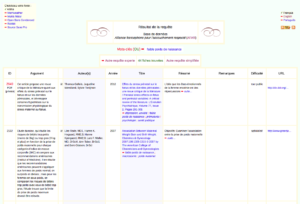 ➡ Images on this page may dis­play a French‐language inter­face. 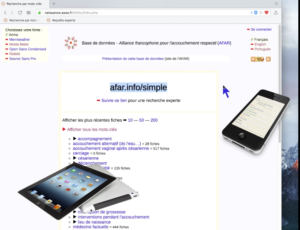 However you can browse the data­base in three lan­guages: French, English and Portuguese. This data­base is intend­ed to meet the need for ref­er­ence med­ical pub­li­ca­tions with respect to child­birth and peri­na­tal care. It can be used by both indi­vid­u­als (users) and pro­fes­sion­als. It allow a quick research on a giv­en top­ic, with­out hav­ing to study dozens of pro­fes­sion­al jour­nals, and to draw a fair gen­er­al idea from read­ing sum­maries. It is not ori­ent­ed towards a par­tic­u­lar agen­da, yet selec­tion bias­es are unavoid­able. For this rea­son we hope to increase the num­ber of con­trib­u­tors cov­er­ing a large range of top­ics. The inter­face has been adapt­ed to nav­i­ga­tion on tablets and mobile phones. ➡ The following is a summary of main features described in the tutorial. Two meth­ods are pro­posed for query­ing the AFAR bib­li­o­graph­i­cal data­base: sim­pli­fied search and expert query. On each page it is pos­si­ble to change lan­guage in a sin­gle click and even choose a dif­fer­ent font for the dis­play. Easy: use the record number! Subscribe to the site: why? It is rec­om­mend­ed to subscribe to the web­site of the data­base. The site will only store your name and email address, all of which will remain con­fi­den­tial. Access to the “edit” mode for the cre­ation or mod­i­fi­ca­tion of records if you have been grant­ed autho­riza­tion after your reg­is­tra­tion. A sin­gle click allows you to beg for it. To sub­scribe, click the link “Log in” at the top right, then “I am not sub­scribed, please cre­ate my account…”. Users reg­is­tered on the site can add their com­ments at the bot­tom of each bib­li­o­graph­ic record. A char­ter defines the con­di­tions of accep­tance of these com­ments (a pos­te­ri­ori mod­er­at­ed). Their pur­pose is to com­plete the arti­cle and pro­vide links to oth­er reli­able sources of infor­ma­tion. Since when has it been oper­a­tional? Who is main­taing and expand­ing it? Is it an exhaus­tive bib­li­og­ra­phy? No, it is non‐systematically fed when arti­cles are iden­ti­fied as impor­tant for users, or when a sys­tem­at­ic review is per­formed on a par­tic­u­lar top­ic. Which fields are required for each pub­li­ca­tion? Do we get the full text for every arti­cle? In any case, arti­cles are sub­ject to “copy­right”, there­by mean­ing that their dis­sem­i­na­tion is sub­ject to con­di­tions. When the jour­nal grants free access to the text, we indi­cate its URL and keep a copy of its con­tent for pub­lic or pri­vate access, depend­ing on its copy­right sta­tus. However the major­i­ty of access­es are on a paid‐basis. To access the con­tent of an arti­cle you must either sub­scribe to the jour­nal or buy the arti­cles — often around 30 USD per arti­cle, what­ev­er its size. It is also pos­si­ble to direct­ly ask for a reprint from the authors or read the paper in an aca­d­e­m­ic library. Do you know (or wish to know) how to search med­ical pub­li­ca­tions, read abstracts most often in English and do a quick analy­sis, or trans­late abstracts? Does the top­ic of med­ical prac­tices dur­ing preg­nan­cy or child­birth inter­est you? If you wish to con­tribute to this bib­li­og­ra­phy, you can reg­is­ter on the data­base and ask to be grant­ed editor’s rights. ➡ Click the “Login” link at the top right of each page, then “Create my account”. You will then be able to add/modify records (addi­tion of abstract, com­ments, full text) with the help of the admin­is­tra­tors. Some very use­ful work requires no doc­u­men­ta­tion skills, such as updat­ing links to pub­li­ca­tions that were record­ed in ancient times. or reg­is­ter and ask us for admin­is­tra­tor access to per­form the import by your­self. Pour une recherche exhaus­tive de références médi­cales, con­sul­tez PubMed (National Center for Biotechnology Information). Un mode d’emploi en français vous est pro­posé par l’Université de Montréal. For an exhaus­tive query of the med­ical lit­er­a­ture, please con­nect to PubMed (National Center for Biotechnology Information). Un index d’articles sci­en­tifiques sur la grossesse et la péri­ode “pri­male” des bébés peut être con­sulté au Centre de recherche en san­té pri­male. Un autre réper­toire impor­tant sur la pra­tique de sage‐femme est celui de UK Midwifery Archive. The Primal Health Research Centre pro­vides an index to the sci­en­tif­ic lit­er­a­ture rel­a­tive to preg­nan­cy and the “pri­mal” peri­od of babies. 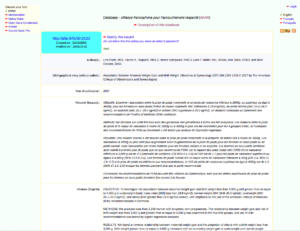 Another impor­tant source on mid­wifery prac­tice is the UK Midwifery Archive.